So a few days before my flight to Tokyo, I was feeling really anxious as I was traveling alone. I wasn't sure if I was able to navigate roaming around Tokyo all by myself because it all sounded too complicated and confusing. But to be honest, I have to say Tokyo is actually the most easiest city to navigate around that I have been to and I was basically just roaming and getting around the city like a local person. XD I never really had to stop and ask people for directions on how to get to places. Except for the few times when I wasn't sure which exit to take at the station. But other than that Tokyo is actually super easy to navigate around with their awesome train systems and train lines. I would feel safe to travel to Tokyo alone by myself again for any of my future trips, lol. The main thing I was concerned about traveling in Tokyo was not having access to the internet and using google map. I had a few apps on my iPhone that could help me navigate around the city and all but they don't work offline so I was feeling extremely paranoid. And then I remember from reading blogs of other people who have visited Japan that you can rent a pocket wi-fi device to have access to internet on your phone. 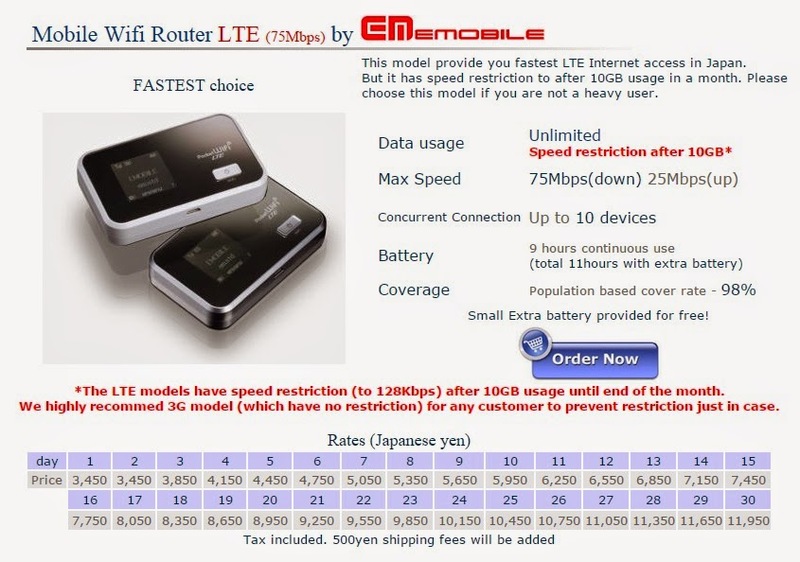 So I did some research and Japan Wireless wifi rental popped up and I was checking their rates and all and it was actually very cheap and reasonable. Their rate depends on the number of days you rent it for. The longer of amount of days you rent it for, the cheaper it is. You can be paying as cheap as to $1/day for unlimited wi-fi access. So let me just explain what exactly is a pocket wi-fi? Basically it's just like a wireless router I would say to describe it. It's a little pocket device you carry with you and you can connect to wi-fi service from your phone. They even provide you with a bag and a prepaid postage mail envelope to return the device at the end of your rental. All you have to do is pack everything inside the zip lock bag and put it in the envelope and drop it at a public mail box that can be found on the street or you can take it to a post office. I just dropped mine inside a mail box near Shinjuku station. They have different wi-fi router devices that you could rent and this was the one that I picked. It has the fastest downloading and uploading speed and longest battery life. I originally rented it for 7 days only to test it out because I wasn't sure how good it was and I ended up extending it for another 7 days. I paid a total about $80 for 2 weeks so I was renting it at about $5/day. The longer you rent the device for, the cheaper it is and if you share it with a group of friends you can even rent it for a cheaper deal! =D You could even rent prepaid SIM data card to insert in your phone so you can have internet access too but I didn't go for that option. Overall I was really impressed with this pocket wi-fi rental service. I would definitely use it again for my future trips to Japan. They also do not just cover internet access within Tokyo only but other regions in Japan too! Also, the staffs were extremely polite and they always responded back to my email inquires really fast.